Football Club Twente are a professional club from the city of Enschede, a city located in Eastern Netherlands. The club were formed in 1965 and play their home games in the De Grolsch Veste also known as The Grolsch Fortress. Here is a Football Manager 2018 guide on the club. Enjoy. Twente’s stadium, De Grolsch Veste, has a capacity of 30,000 people and is named after the alcoholic beverage Grolsch who’s headquarters are located in Enschede. FC Twente have only ever won the Eredivisie title once back in the 2009 – 2010 season when former England manager Steve McClaren lead them to glory by just a single point over Ajax. Notable former players for FC Twente include ex-Spurs winger Nacer Chadli, who won the KNVB Cup in his first year with the club, the late great Cheick Tiote who went on to make 52 appearances for the Ivorian National team before his death in 2017 and also Dutch national team player Eljero Elia who spent a couple of years at the club before moving to Hamburg and then to Juventus back in 2011. In my opinion Moroccan winger Assaidi is definitely the best player in this FC Twente squad. He can be used as either a left or right winger but I would recommend using him on the left wing so that he can cut inside on his stronger foot, he has a lot of impressive attributes and these include 15 technique and dribbling and also 14 first touch and flair. The other top player at FC Twente is defender Hidde ter Avest. With some decent attributes including 12 marking, heading and tackling, Ter Avest can easily be trained to play as either a CB or a RB, however I would definitely recommend that you play him in his natural position of right-back to begin with. I believe that the first area you should look to improve in the FC Twente starting eleven is goalkeeper – Jorn Brondeel is the current starter but I don’t believe he is good enough if you want to be challenging for the all-important Eredivisie title. However at just 23 years of age he would be a useful rotation GK for the future. Our first hot prospect in the FC Twente ranks is Jeroen van der Lely. This young full back will be your back up right back behind Hidde ter Avest, providing you train and tutor him in the right way he could certainly become a starter for you in no time at all. Van der Lely has some decent attributes including 13 tackling and heading and 14 marking. Our second hot prospect is a Finnish youngster who goes by the name of Fredrik Jensen, he can play anywhere behind the front three or as a CM but I believe he is most suited to playing as an AM. With some decent attributes including 14 technique and 13 first touch and passing, Jensen certainly has the potential to play in your first team in the years to come. 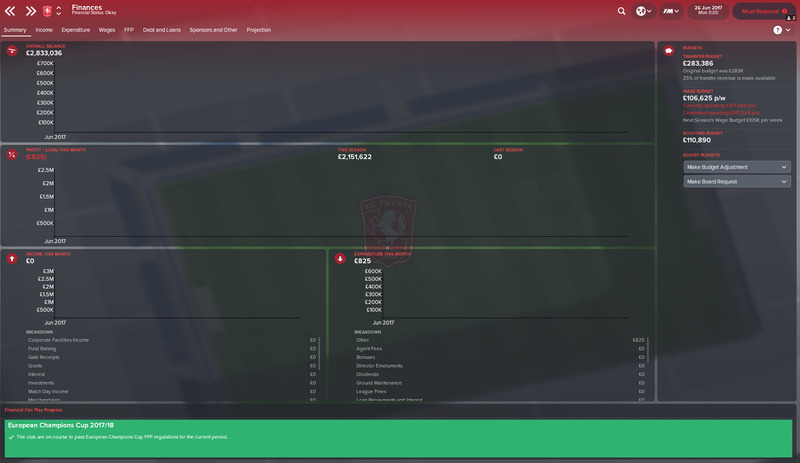 FC Twente have okay finances but it will be difficult to bring in some new players without selling some of your stars in the first season with a transfer budget of just £130k and a wage budget of just a measley£2k! 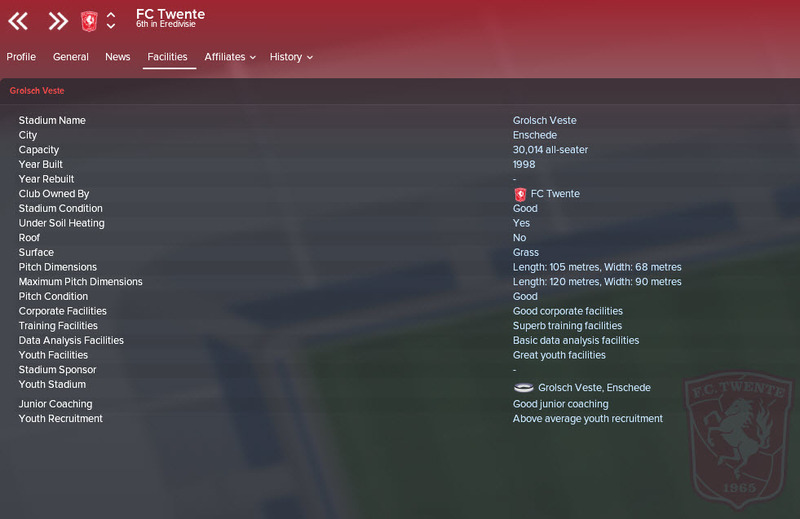 So good luck to everyone who manages FC Twente and I hope you have a fun time over in the Holland, please let me know how you get on in your saves either in the comments by heading over to my Twitter @Casual_FM_ thank you for taking the time to read this club guide! 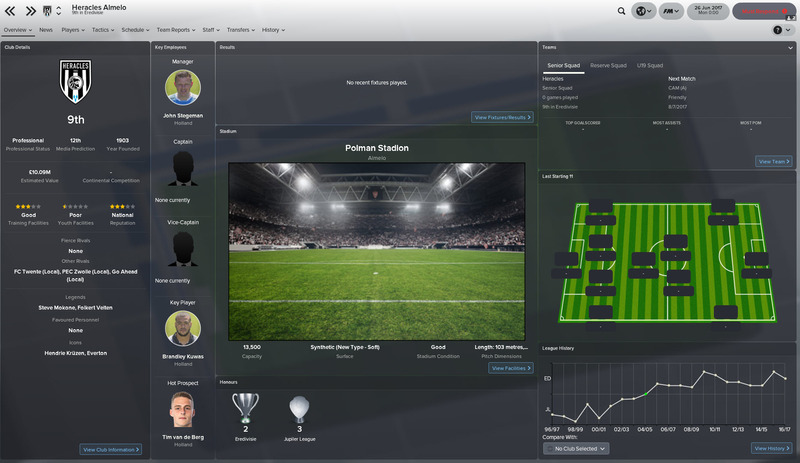 This entry was posted in FM Guides | Club Guides, FM18 Guides, Experiments & Wonderkids, Football Manager 2018 and tagged dutch eredivisie, fc twente, FM Guides, fm18, football manager, holland. Bookmark the permalink.